According to the safety requirements of International Association of Mountain Guide Associations (IFMGA), during this program one guide can work with only one participant. It is perfectly in line with our concept of security on the routes of such complexity level. Generally, we can offer Matterhorn ascent from any side, but we decided to conduct our regular tours from the Italian side. Matterhorn ascent is usually a logical continuation of Mont Blanc ascent. 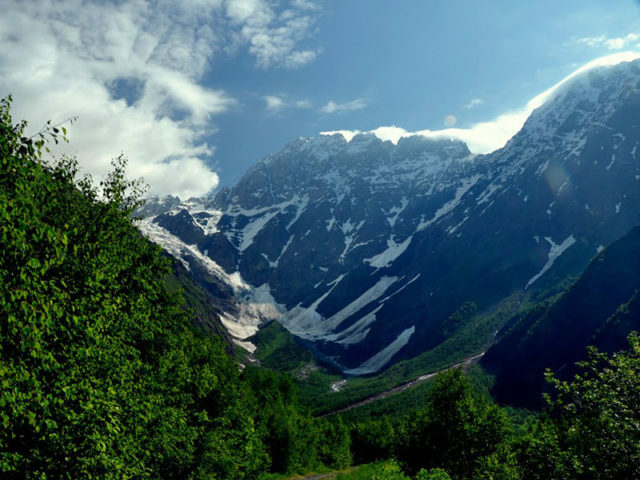 There is a lot in common: no living in tents during the tour, comfortable accommodation and a minimal amount of equipment in a backpack, along with quite interesting peaks and not the easiest route. 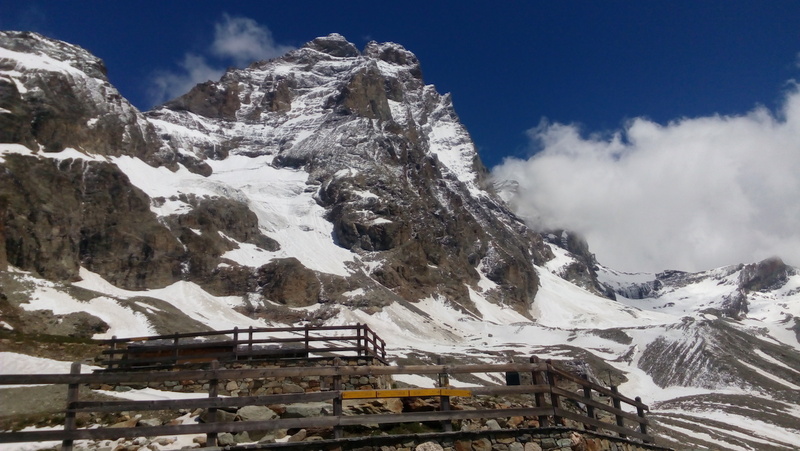 Technically Matterhorn ascent is rather complex, it is not a pedestrian route, guides-clients ratio in our Matterhorn ascent programs is always strictly 1:1, as we do not consider all other options to be safe enough. 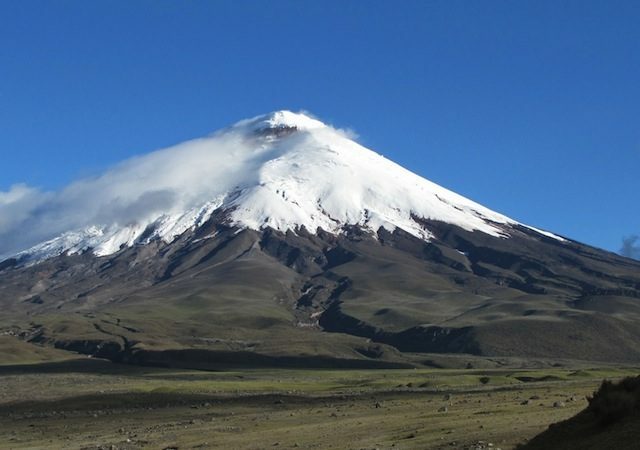 Despite not very high altitude, acclimatization is vital, as any delay or slow movement along the route is very undesirable, and the relief is not very suitable for any physical assistance by other person. The program of guided ascent to Matterhorn. Day 1. Geneva (Switzerland) – Courmayeur (Italy). Arrival. The plane to Geneva and then shuttle to Courmayeur. In Courmayeur: meeting with the guide, discussion of plans and program, solving organizational issues. Day 2. Courmayeur – Torino hut – Égvi D’Ontov – Torino hut. Preparing for the upcoming climbing, training on the rocks and checking equipment. The main purpose of this day is to get prepared as much as possible for the upcoming Matterhon ascent, i.e. training in climbing the rocks. On the Skyway cable car we ascend to Torino hut (3375m). Further we move to the glaciers and climb on top of a small rock summit Aiguille D’Entreves (3600m). 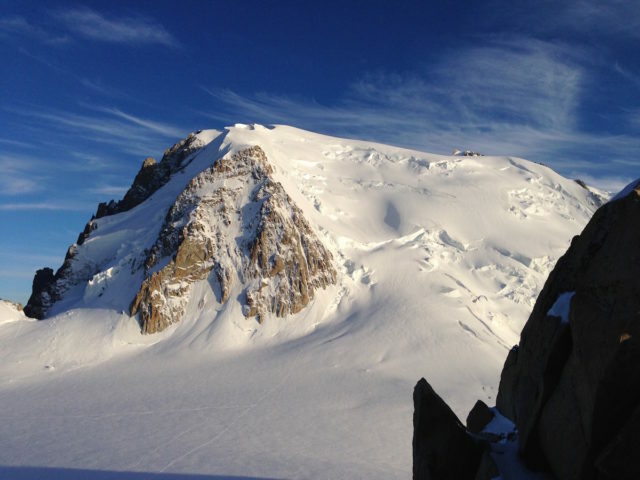 In good weather there is a great view on the Mont Blanc massif from the summit. After the ascent we go back to Torino hut, accommodate there and get prepared for the next ascent. Ascent/Descent: 2386 m/225 m, from them on foot 225 m/225 m. Time of walking: 4-5 hours. Day 3. Torino hut – Tour Ronde – Courmayeur. Acclimatization and training ascent on the rock Tour Ronde (3792 m). Early start, as the climbing is to be quite serious. First moving along the glacier, then walking by the rocky ridge to the summit. Descent by the same route back to the hut. On the same day we descent to Courmayeur. Very interesting and challenging ascent. It includes all elements of the upcoming Matterhorn ascent. Ascent/Descent: 417m/2568 m, from them on foot 417 m/417 m. Time of walking: 6-7 hours. Day 4. Courmayeur – Zermatt (Switzerland) – Hörnli hut. The first stage of Matterhorn ascent, ascent to Hörnli hut (Hörnlihütte, 3260m). Transfer to Zermatt. Then we go by cable car to Schwarzsee, and then walk on foot to the hut. Ascent/Descent: 1652m/0 m, from them on foot 708 m/0 m. Time of walking: 2-2.5 hours. Day 5. Hörnli hut- Matterhorn – Matterhorn ascent (4478m). Descent to the valley. Zermatt – Courmayeur. The most responsible and hard day of the program. Starting in the early dawn and immediately moving up to the challenging rocks. Difficult and complex ridge, in some places snow can lie on the rocks. However, the most problematic part of the climb is the top tower. It is very important not to bite more than one can chew, because after the summit ascent there will be equally long descent. When we return to Hörnli hut there will be a short rest. Then we continue moving down to Zermatt. Transfer to Courmayeur. 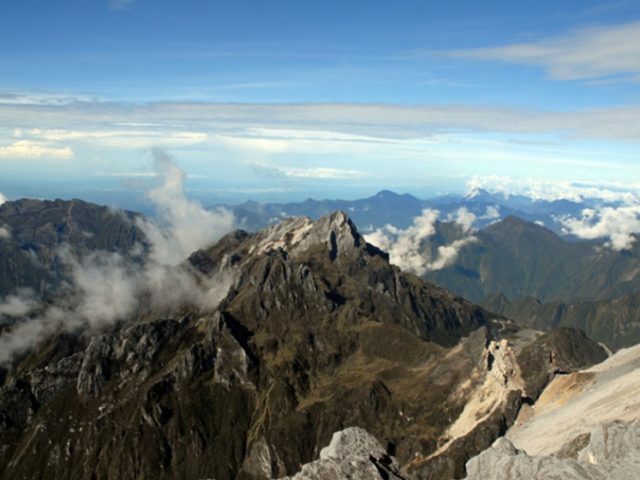 Ascent/Descent: 1218m/2870 m, from them on foot 1218 m/1926 m. Time of walking: 10-12 hours. Day 6. Reserve day in case of bad weather. If it won’t be used, you can devote it to sightseeing. Day 7. Courmayeur – Geneva. Departure. Transfer to Geneva. The plane back home.